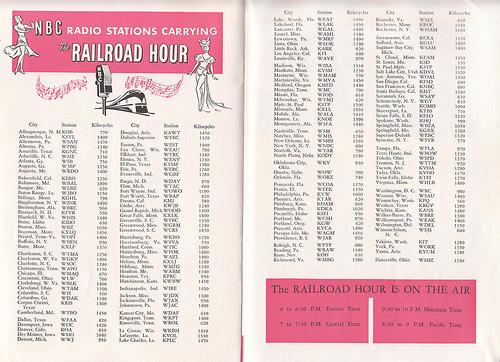 Old Time Radio features The Railroad Hour: 160 episodes from the golden age of radio of the classic old time radio show. For more Gordon MacRae see also: The Gulf Spray Program and The Gordon MacRae Show (Texaco). Additional musical radio broadcasts include: Glenn Miller, Bing Crosby, Command Performance, and Your Hit Parade. The book, The Railroad Hour, (by Gerald Wilson and Martin Grams, Jr) features an episode guide with titles of all songs in correct sequence and the vocalist for each song, plus the origins of all musicals with plots and cast lists.